Operation Zitronella took place on 8th September 1943. Though the name might conjure up images of a campaign fought across the hot Mediterranean shores, nothing could be further from the truth. 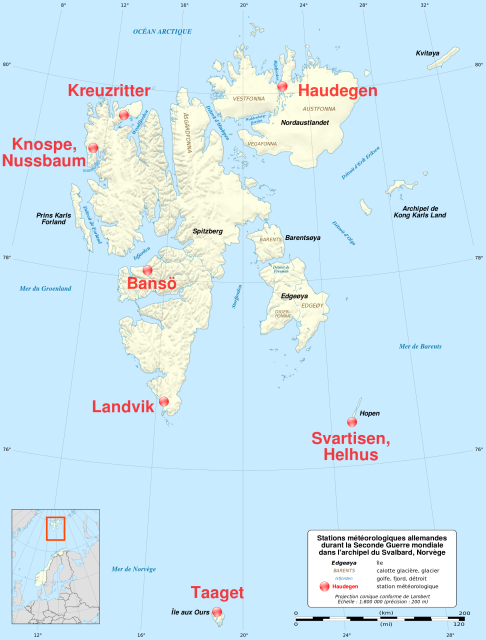 It was the code name for a German raid to destroy an Allied weather station on the Island of Spitzbergen, the largest of the Islands making up the Svalbard Archipelago in the Arctic Sea. Svalbard, which consists mostly of uninhabited islands, is located roughly halfway between Norway and the North Pole. Its strategic importance was due to its position in the Barents Sea, which provided a route for Allied supplies to and from Russia. It was also an ideal location for meteorological observation and, in fact, its remote top-secret weather station was the last outpost to finally surrender three months after the war in Europe had officially ended, and twp days after Japan surrendered. During the 17th and 18th Centuries, the Islands had been used as whaling stations. Later on, in the 19th Century, coal and other important minerals were exploited, as mining became the key industry. The islands had been under German sovereignty until the end of the First World War, after which they were passed to Norway under the Treaty of Versailles. It is unsurprising therefore that Germany sought to re-take the territory that had previously been under its control. In April 1942, a Norwegian force landed at Barentsburg in Operation Fritham to establish a permanent presence in the islands, but this operation met with considerable difficulties. Nevertheless, by the summer of 1943, they were well established. On the 6th September 1943, the German Naval Command assembled to launch an attack on the remaining Norwegian garrison at Spitzbergen. The attacking forces used two large battleships; Scharnhorst and Tirpitz, as well as a number of smaller ships. A dawn raid two days later brought them a decisive victory. Both the Tirpitz and the Scharnhorst opened fire on the Norwegian defenses before running inshore with landing parties. By noon, the battle was over. Nine Norwegian soldiers were killed while a further 41 were taken prisoner. 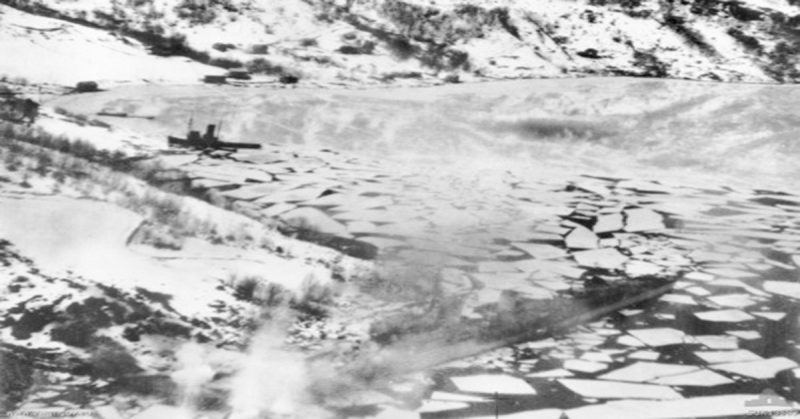 The supply dump and a radio station were also destroyed before the German ships returned safely to Altenfjord and Kåfjord on the coast of Norway. The remaining Norwegian forces withdrew into the hinterland and were quickly resupplied after the Germans had withdrawn. The modern Meteorological Station on Hopen Island. 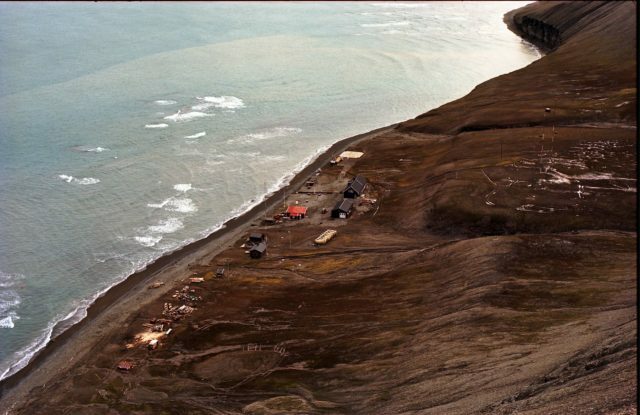 After their successful raid on Spitzbergen, the Germans used their advantage to establish a number of weather stations, the most famous being on Hopen Island, one of the many smaller of the uninhabited landmasses. In September 1943, under the code name Operation Haugeden, an eleven man crew set sail, along with a supply ship, to carry out a job that would provide crucial information to the German commanders. Like both its enemies and its allies. Germany needed to have reliable weather information in the North Atlantic and Arctic Oceans. It also wanted to prevent other countries from gaining valuable information about the weather conditions. Meteorological data was important primarily because it affected military planning. It allowed better planning of routes for ships and convoys. Being able to predict levels of visibility was also an important factor in planning successful operations. For example, sometimes good visibility was required to allow reconnaissance flights and bombing raids, or to facilitate photographic missions. It was also helpful to be able to predict periods of poor visibility which might conceal ships or hamper enemy action. Meteorological broadcasts not only provided their own side with the information they required, but they could also be used to confound the enemy. Knowing that the broadcasts were often intercepted by the opposing side, coded false data and misinformation could be disseminated. The conditions the soldiers of Operation Haugeden encountered on Hopen Island were very different from their homeland. Thanks to the remoteness of the location, there was little risk of attack from enemy troops, but the risk of encountering polar bears meant that the men could not go outside without taking their weapons. 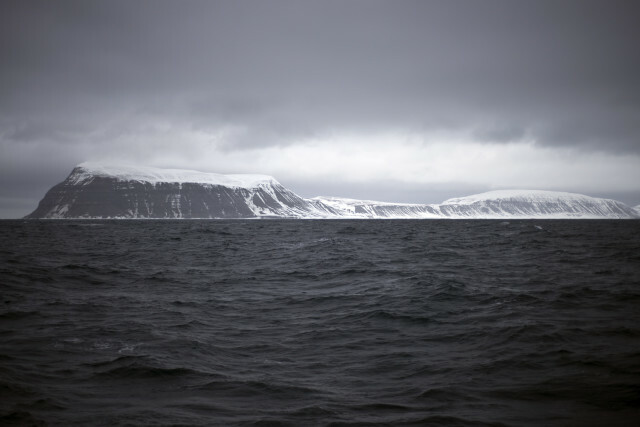 Surrounded by dense drift ice in temperatures as low as -40 degrees Celsius, there was a constant risk of frostbite and hypothermia. As it also turned out, there was a very real risk that the weathermen could end up being stranded on the Island, if they were to lose contact with the comrades elsewhere. This was all the more likely due to the top secret nature of their activities – in fact, that’s exactly what almost happened. The Hopen weather station remained active from 9th September 1944 until 4th September 1945. In May 1945, shortly after Germany had officially surrendered, the weather station lost radio contact and having only a small rowing boat available for transport, the soldiers had no option but to remain on the Island. They continued as before, living on their rations of tinned food – which would easily last them for another year – and continuing to broadcast their weather reports while attempting to make contact with the outside word. It was not until August 1945 that they were able to regain radio contact with Germany and call for help. In the end, help arrived in the form of a Norwegian seal hunting vessel which picked the men up on the 4th September 1945. The Norwegian captain invited the German soldiers to join him for dinner, an offer which must have been very welcome after so many months of surviving on tinned food. The German soldiers were unsure how to respond to this invitation from their former enemies. The German Captain decided to make a formal gesture towards the Norwegian Captain. He took out a pistol which he laid on the table announcing that it was now time for them to surrender. The Norwegian captain was surprised by this strange turn of events and asked if he could to keep the pistol as a souvenir. The German captain agreed to his request and afterwards they shared a meal at last under the auspices of peace. And so, the eleven soldiers of Operation Haugeden became the last German troop to surrender, three months after peace had been declared in Europe.